Pluots have the initial appearance of a mottled plum. Their colorings range from red-skinned and pale amber-skinned to ruby-fleshed and blazing gold fleshed. The skin is taut and thin, clinging tightly to the fruit's flesh. Their skin breaths and excretes a film or coating that sits as a residue on the fruit. Most pluot varieties are extremely sweet, often spicy, low-acid fruits with a juicy, chin-dripping tender firm flesh, qualities that the fruit was developed to achieve. When multiple variates of pluots are planted in the same orchard scattered pollination between trees will occur, often times this imparts an enriched flavor to the fruits. Pluots are available from spring into fall. Pluot is the registered trademark name given to a stonefruit that was developed by Floyd Zaiger of Zaiger Genetics in 1989. Zaiger developed the original pluot from plum and apricot lineage. Zaiger develops all of his hybrid fruits by hand pollination versus genetic modification. The attention and care taken to create a pluot from parent varieties is painstakingly precise. Floyd Zaiger created the original pluots under extreme temperature control, transferring pollen from one fruit to the next with a tweezers. There are dozens of pluot cultivars that range in sugar content, color and rate of maturity. Common marketing names include Dapple, Hand grenade, Flavor Fall, the Dinosaur Egg and the supreme variety, Flavor King. Pluots are high in vitamins A and C, potassium, calcium, phosphate and dietary fiber. These nutrients are important for a strong immune system, a healthy digestive system, lowering cholesterol levels, and prevent the negative effects of free radicals. The darker pigmented varieties also provide a rich source of antioxidants. Pluots, like other stonefruit, are best enjoyed fresh at their peak of ripeness. They may also be baked, roasted, sauteed, pureed or cooked for jams, compotes, ice creams and reductions. Complimentary flavors are vanilla, nutmeg, tropical fruits, chocolate, citrus, basil and chiles. Other favorable pairings include pork, lamb, grilled shellfish and crudo-style seafood. To store, let ripen at room temperature and store in refrigerator for up to one week. Pluots are the result of grafting apricot and plumcot trees onto plum tree rootstock. They are not the first ever plum-apricot hybrid to be developed; that distinction is held by the plumcot, a 50/50 blend of plum and apricot. 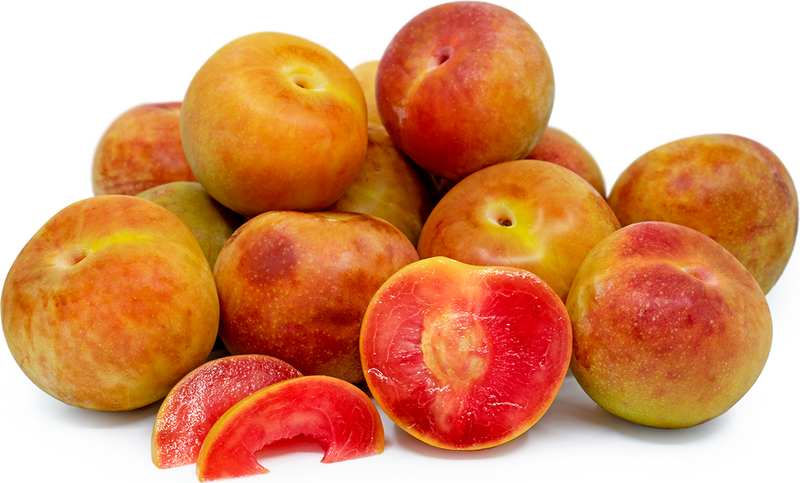 The ratio of hybridization in pluots, though is, by definition, 75% plum and 25% apricot, though it could vary, but the rule of thumb is more plum than apricot. The result is a fruit which draws on the best qualities of its parents to create a new fruit perhaps better than its origins - much like technology, improving upon its previous carnation. Pluots evolved out of the intention to improve the plum's status within the stone fruit industry. Like most stone fruits, pluots thrive in regions such as the San Joaquin Valley and the eastern Mediterranean coast, where winter time temperatures are cool but not cold and the summer season is long, warm and dry. Recipes that include Pluots. One is easiest, three is harder. 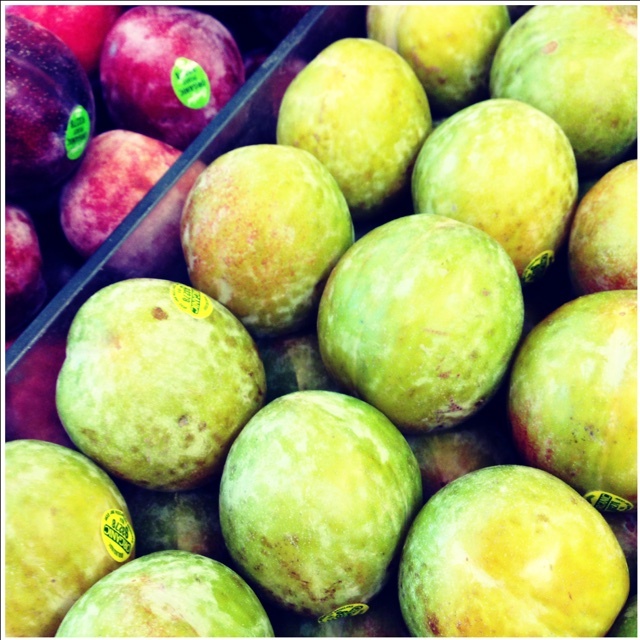 People have shared Pluots using the Specialty Produce app for iPhone and Android. 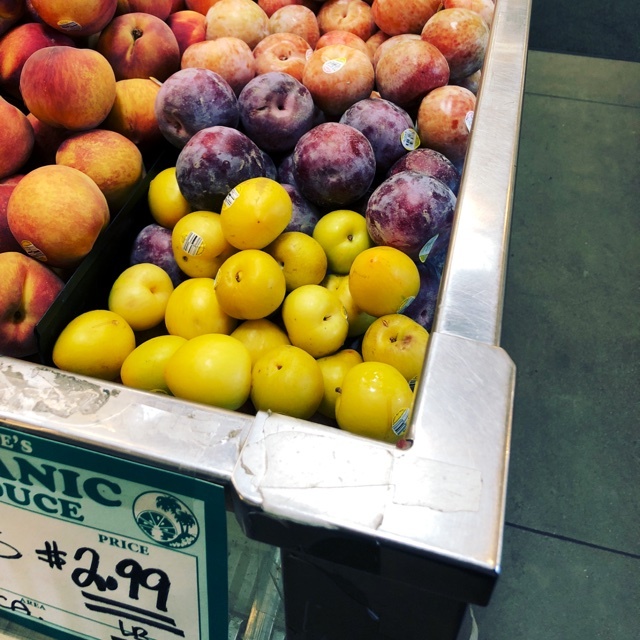 Sharer's comments : Pluots spotted at Ocean Beach People's Organic Food Market. Different colors and hybrids. Sharer's comments : Pluots spotted at Costco 1023 . 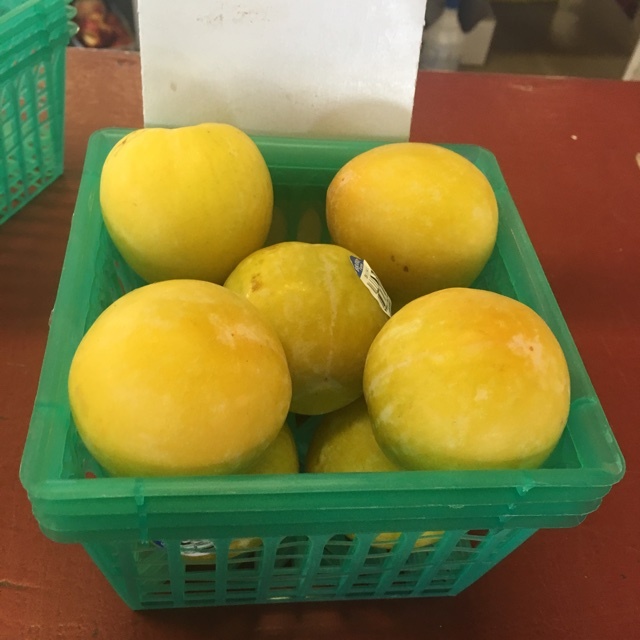 Sharer's comments : Pluots spotted at Tomatomania! Tapia Bros. Produce. Light yellow pluots. 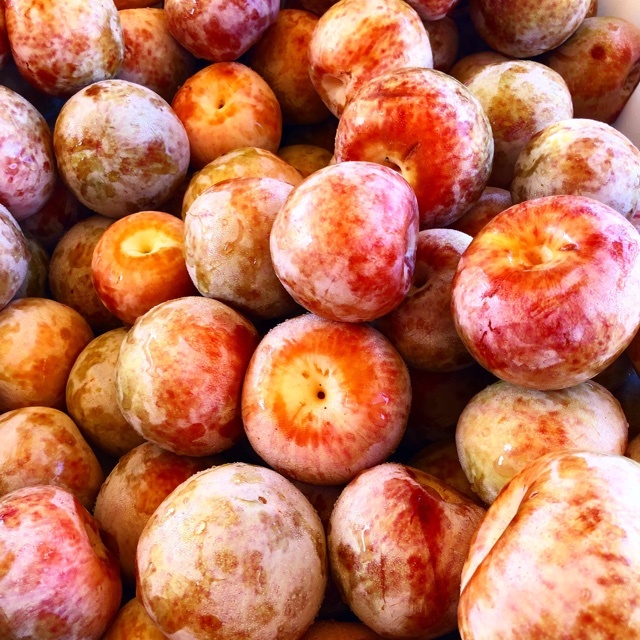 Sharer's comments : Pluots spotted at Leucadia Farmers Market . Dino eggs also known as Dapple Dandy Pluots! 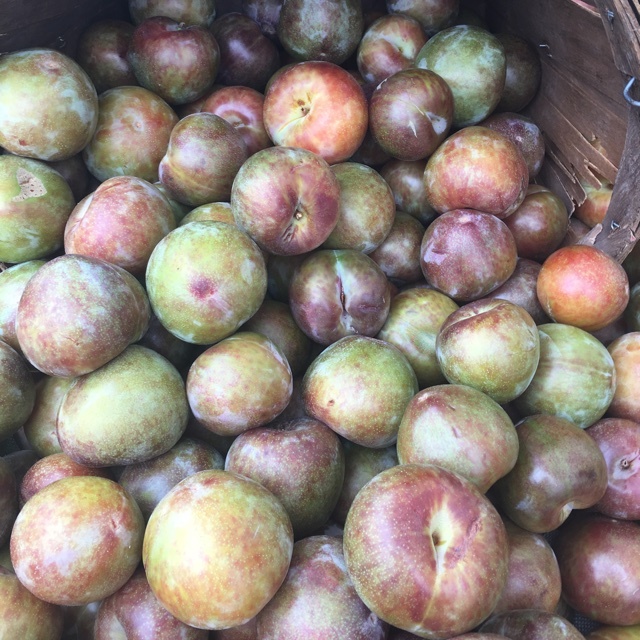 Sharer's comments : Pluots spotted at Brentwood Farmers' Market. Watermelon variety. 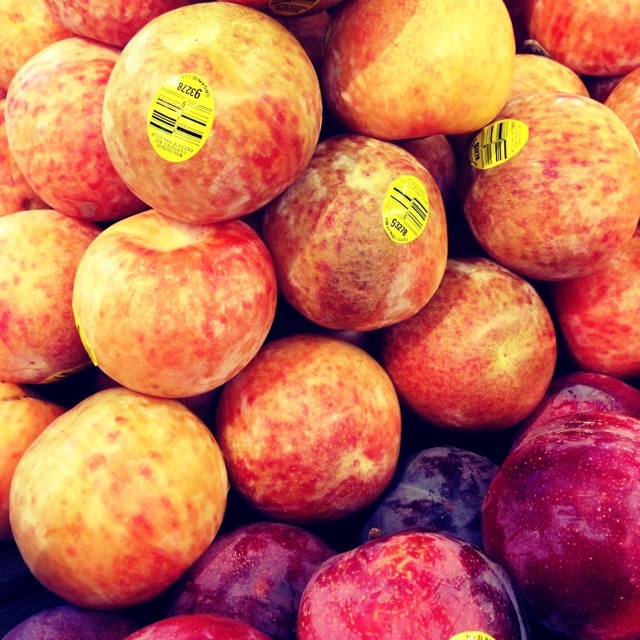 Sharer's comments : Pluots spotted at PCC Natural Markets. Organic Flavor Grenade Pluot - Crisp, refreshing pineapple and juicy apple flavor!